We have put together an exhibition of the Kings and Queens, their illnesses, their deaths, and the public health messages their stories portray. The messages include preventable diseases such as obesity, smoking, and vaccination for smallpox, along with the problems of overtreatment, its consequences and its effect on speeding up the death of some of the monarchs. 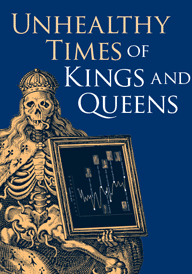 Historically, great harms were caused to the health of the Kings and Queens of England. Charles II died following an apoplectic fit despite, or because of, being subjected to various treatments such as bloodletting, purging, blistering, and cupping. Could evidence-based interventions have changed the outcome for our country’s Kings and Queens and subsequently, the course of history? 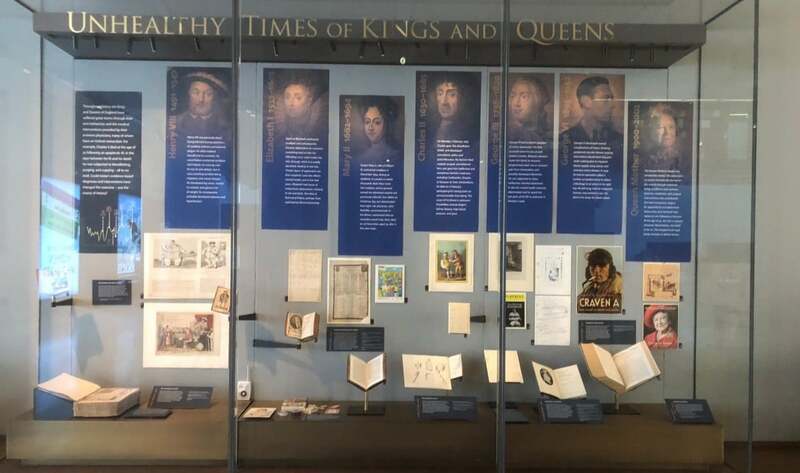 At the Bodleian Library, in Oxford, we have put together an exhibition of the Kings and Queens, their illnesses, their deaths, and the public health messages their stories portray. The messages include preventable diseases such as obesity, smoking-related illnesses, and vaccination for smallpox, along with the problems of overtreatment, its consequences, and its effects on speeding up the deaths of some of the monarchs. Smoking and obesity, which remain modern day problems, were also an issue for England’s monarchs. As a young man, Henry VIII was fit and athletic. But a jousting accident severely hindered his ability to exercise. He developed leg ulcers, started to overeat, gained a lot of weight, and probably developed diabetes and hypertension. At the time of his death, he weighed about 28 stone (178 kg) with a 52” waist his body mass index (BMI) rose to 50, shortening his life expectancy by up to 10 years. George VI was a heavy smoker, and as a consequence he developed peripheral vascular disease causing intermittent claudication (leg pain while walking, due to impaired blood supply), lung cancer, and coronary artery disease. In 1949 he had an operation called a lumbar sympathectomy to relieve a blockage in an artery in his right leg. His left lung, with its malignant tumour, was excised in 1951. After the War cigarettes were cheap, widely advertised, and readily available. It therefore wasn’t surprising that George VI smoked. At the time Britain had the highest prevalence of smoking in the world. Two years after King George VI died, Oxford academic Richard Doll showed that lifelong smoking reduced life expectancy by 10 years. The exhibition also shows the dramatic effect of over treating Charles II, precipitating his death. Having access to a physician in the 17th and 18th Century was probably a terrible idea. On Monday 2 February 1685 Charles II gave “the dreadfulest shriek” and developed convulsions, pallor, and speechlessness. Charles II lay dying. His physicians held his teeth open to stop him biting his tongue. They removed pints of blood by cutting veins open and by cupping. They gave him emetics and purgatives. They shaved his head and applied blistering agents. When more bleeding and purging failed, they gave him extract of human skull. They forced down his throat herbs, animal extracts, and tonics. Despite, or because of, their ministrations, he died on 6 February, apologising for having been “an unconscionable time dying”. The cause of his illness is unknown. Possibilities include Bright’s kidney disease, high blood pressure, and gout. If you have time why not visit the exhibition, where more stories like this are on display. You’ll find out about the madness of King George III, the death of Mary II from smallpox and Elizabeth I excessive use of lead-containing makeup that caused melancholy and depression that affected her later life. Carl Heneghan is supported by The National Institute for Health Research School of Primary Care and The NIHR Oxford Biomedical Research Centre.